Your guided walk on the Kepler includes a helicopter flight! Fiordland is home to some of the finest walks in the world. From jaw-dropping mountain vistas to rainforests, rocky bluffs, thundering waterfalls and ancient beech forests, the hiking trails in this part of the world really set the standard when it comes to scenery! The Kepler Track, Milford Track and Routeburn Track all showcase our most stunning landscapes – and each one is very different to the next. Our 3 Great Walks in 3 Days tour & accommodation package is the perfect option for guests who are limited by time, or who want to get a taste of each Great Walk. Price includes accommodation in our Premier Apartment for two people, and is valid from 1 October 2018 – 30 April 2019. This package also includes lunch on each guided hike day, complimentary bottle of bubbly on arrival and x2 film tickets for Ata Whenua Shadowland. If you would like to add the Exclusive Radfords Continental Breakfast – a great start to the day – for NZD$19.00pp, please advise at time of booking. On the day after arrival begin the journey being picked up from Radfords on the Lake at 8am with a spectacular scenic drive along the Milford Road to the Divide Shelter, which is the starting point for the guided walk to Key summit. There are opportunities for short nature walks and photo stops along the way. Departing from the shelter, the walk ascends through lush, temperate rainforest on a well maintained track. The steady climb takes approximately 2 hours at a leisurely pace. A maximum of 12 walkers with a guide provides an excellent opportunity to learn about the natural and human heritage of Fiordland. Gaining an elevation of 400 metres, emerge from the forest into the alpine environment, with panoramic view of high snowy peaks, alpine lakes, and deep bush clad valleys. On a fine day lunch is on the summit amidst the alpine tarns, and in unfavourable conditions in the shelter of a nearby tramping hut. Make your own way to Milford (leaving Radfords’s by 6am, meeting at Milford Sound Lodge at 8am and retuning at 1pm, soak up the grandeur of a guided walk to Giant’s Gate Falls on the world – famous Milford Track. Departing from Milford Sound, we begin with a short boat ride to Sandfly Point. The walk meanders alongside the cascading Arthur River through lush rainforest to Giant’s Gate Falls. This spectacular waterfall is best viewed from the large swing bridge spanning the river. There is much to see, from the ancient tree’s towering above, to the vibrant ferns and mosses, plus the array of birdlife inhabiting this lush environment. On conclusion of your guided walk, complete the Milford Sound experience with an afternoon Scenic Boat Cruise 1hour 45minutes in length leaving at 1.45pm returning at 3.25pm. With purpose-built observation lounges and large decks, you can be sure you’ll get some great viewing opportunities including the geological drama of sheer cliffs, massive waterfalls, glaciers and rainforest. NOTE: Transport can be arranged at an additional charge of $100 per person return if required. 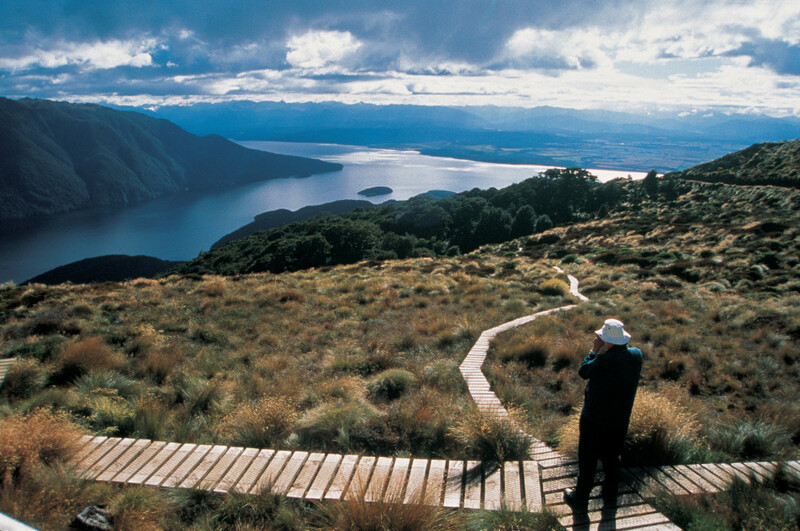 Experience a guided heli-hike on the Kepler Track. Pick up from Radfords at 10am, begin with a spectacular flight by helicopter from Te Anau Township, over the Hidden Lakes to arrive at Luxmore Hut. The walk begins in the alpine area then descends through magnificent beach forests. 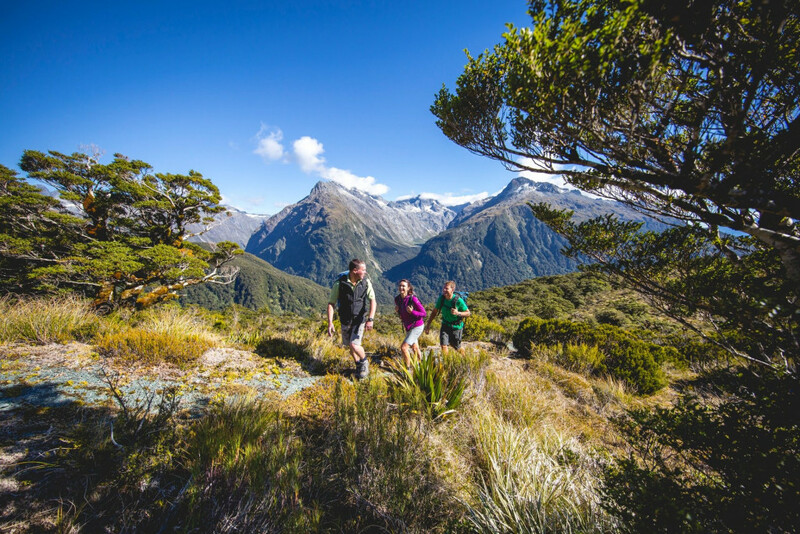 The effects of different altitude and weather conditions experienced in Fiordland are clear to see, as the tree’s and undergrowth quickly changes, creating a varied backdrop for your hike. We conclude the hike at Sandy Beach of Brod Bay, the pick up point for the water taxi back to Te Anau township returning at 3.30pm.